Stowe locals know Jamie Persky as the woman behind Jamie's on Main, the popular Main Street breakfast-and-lunch spot that Persky and her husband, Mark Rosman, sold in 2011. "We stopped loving it and stopped having a good time," Persky recalls. But the couple will return to the restaurant biz on March 12 when they open Plate. The two Los Angeles natives have taken over 91 Main Street with a well-defined concept: They'll bring California cuisine to Vermont. Chef Aaron Martin, a Hen of the Wood and Stowe Mountain Lodge alum, has the bona fides: The young cook spent October doing a stage at Alice Waters' San Francisco locavore mecca, Chez Panisse. "I have an open invitation to go back if I ever find the time," says Martin, who adds that his new ties to California have influenced him to cook "healthier and lighter food." For Plate, that means lots of big, hearty salads, along with dishes catering to vegan and gluten-free eaters. Martin plans to do a daily "pasta dish," though his first offering is sans pasta: a paleo-diet-friendly coconut soup with spaghetti squash instead of noodles. Beef, veggie and salmon burgers will have their place on the menu. The beef burger will be cold-smoked before grilling, then served on challah with housemade aioli and pickles. 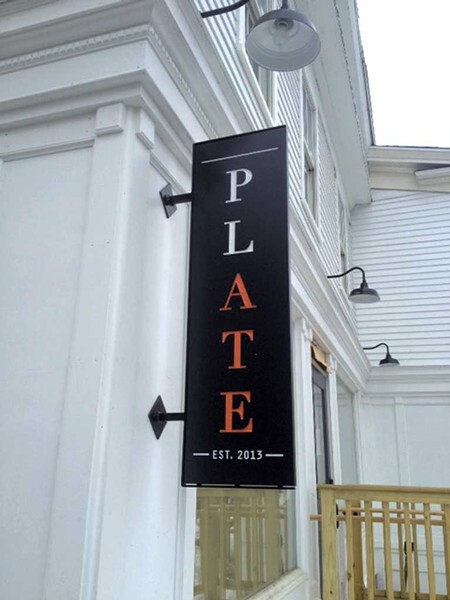 Just don't expect fries with that: The 50-seat restaurant has no fryer. That means even pub-food staples such as chicken wings will take healthier forms there. Plate's huge mercantile window has been attracting attention from locals, Persky says. The couple will introduce dinner first and start serving lunch eventually. As for morning fare, Persky says she had her fill of that at Jamie's on Main, joking, "I don't even want to eat breakfast anymore." The original print version of this article was headlined "Blue Plate"